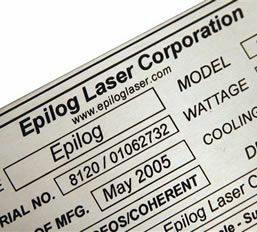 Having watercut and grained a part we can mark it for you using our in house C02 Laser Cutting and Marking machine. We use the Cermark metal marking process to make high contrast, permanent marks on various metals with our C02 laser. Marks can be made on stainless steel, aluminium, tin, copper, brass, chromed steel, titanium and tungsten carbide. So if you are looking for a complete nameplate or just to add an ID number we can achieve this for you. The CO2 laser will also cut non metallic materials and simultaneously give a polished cut edge on some plastics, compared to the sandblasted edge given by our waterjet process. The maximum part size for cutting or marking is 600mm x 450mm.